No one quite knows when we started to use forks, but they are a fairly recent invention. Knives, on the other hand, are as old as man’s need to cut and kill. They were made of whatever was found hard and sharp enough: bone and chipped stone and, later, bronze and iron. The first spoons were probably curved shells. A book on table manners written five hundred years ago told people not to grab their food with both hands, but pick it up politely with three fingers only. Another book warned children not to take food with the hand they used to blow their nose. Food at this time in Europe was chopped up at table with a knife. Usually the knife had a sharp, pointed end so that you could skewer the meat and put it in your mouth. A fork was occasionally used to hold the meat down while chopping off chunks, or for serving. Most men owned just one knife, which hung at their belt ready for everything. One day it would carve the joint and the next it might carve an enemy’s throat. 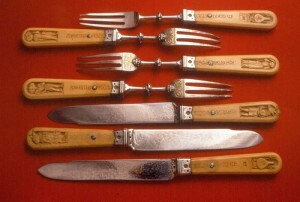 Only the wealthy nobles had special sets of knives for eating. 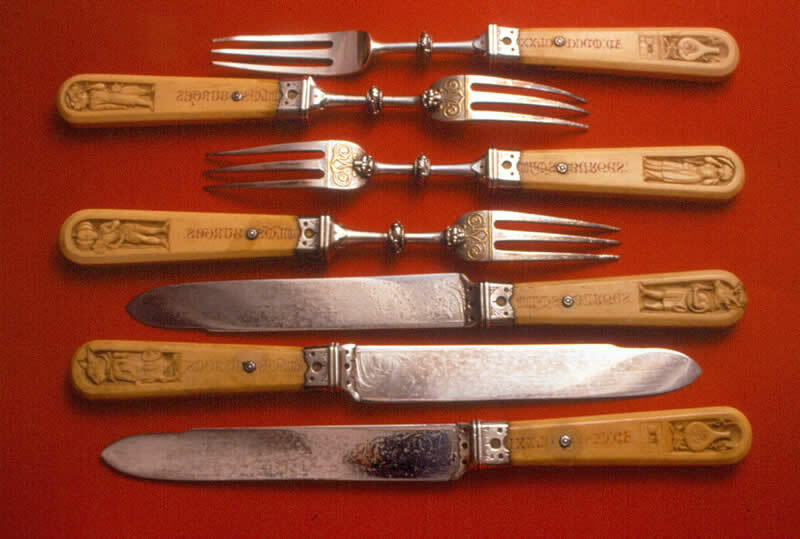 Even after forks were introduced, many of the nobles in Europe continued to use their fingers. In the seventeenth century a knife and fork, or two knives, made a good wedding present for a bride. They hung at her girdle in a decorated sheath. When the rich went travelling they carried their own set of knife, fork and spoon with them. Most inns did not provide any.